What to see and do in Athens with your family if you only have one day to spend? Athens is my hometown and I absolutely love this city. 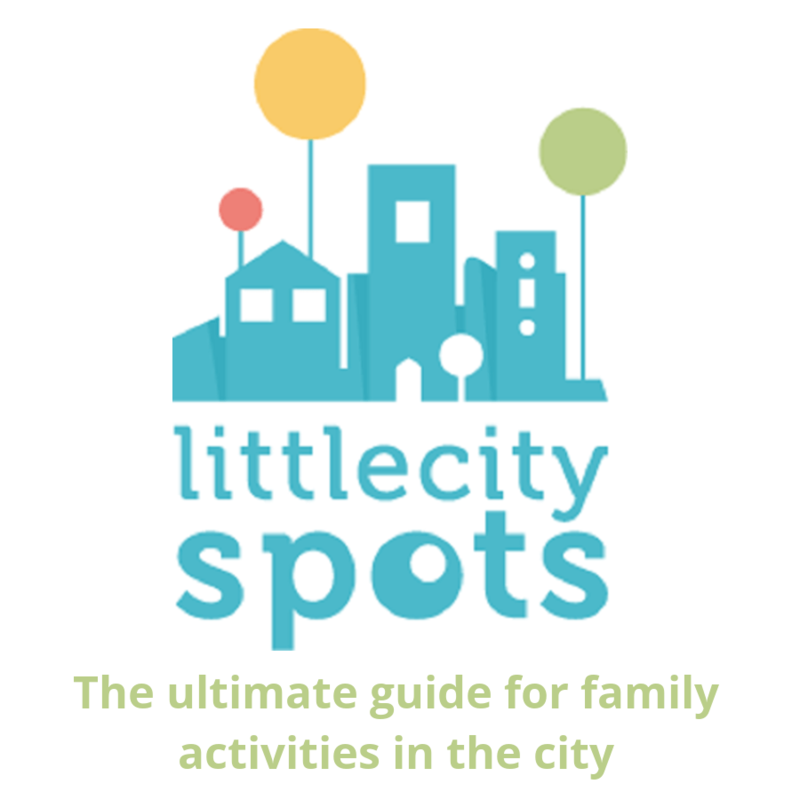 I often take my kids downtown because there is always something to do. 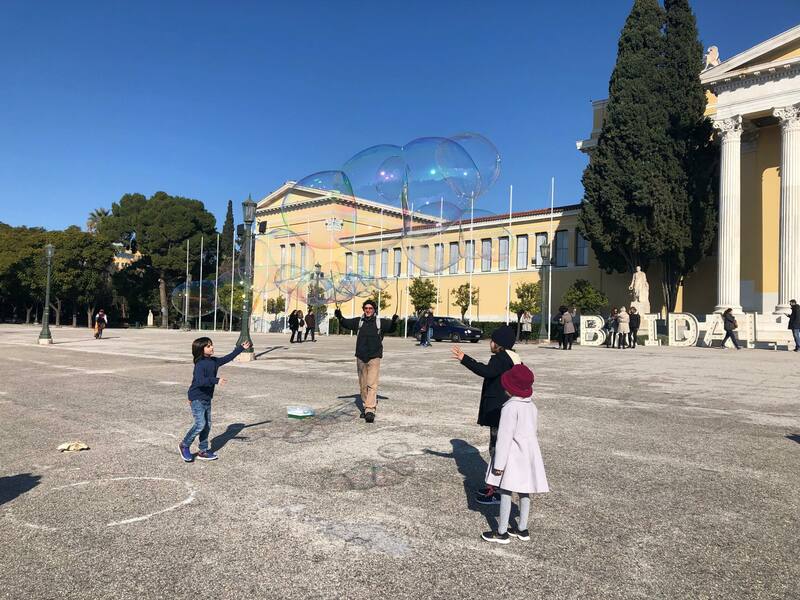 On this blog, you can find many activities, tours and places to visit in Athens with your children. But what if you are visiting Athens only for one day? 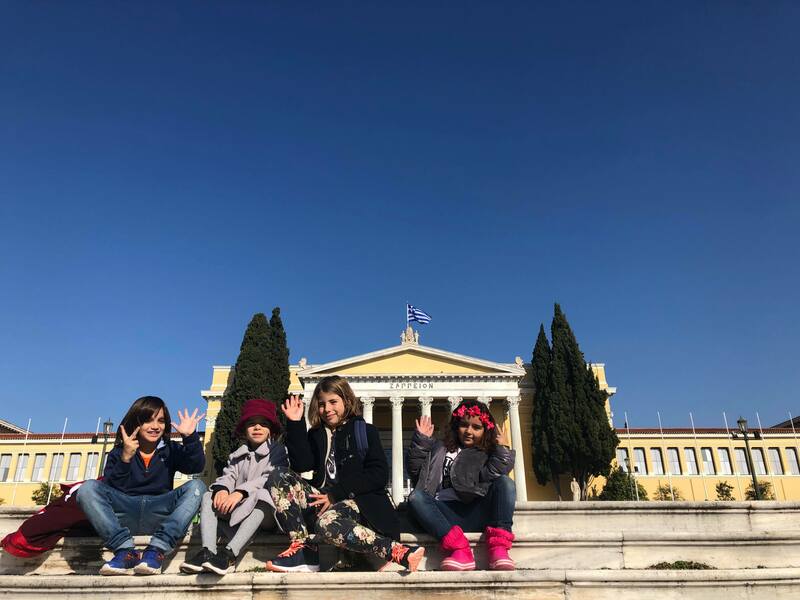 What is the best way to see most of Athens' famous monuments and what should you do to discover the Athenian culture if you had only one day in Athens with kids? I designed a walking tour. All parents know that travelling and exploring with young children has its limitations. It is not possible to visit the ‘Top 5 Athens favourites’ in one day. And ‘24-hours’ usually means from ’6am – 8pm’ with a lot of breaks and maybe a nap or two. 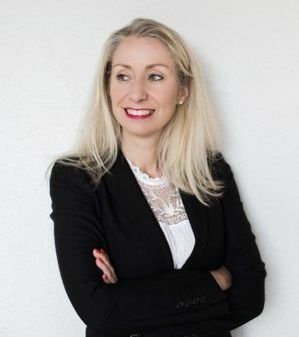 If your baby is young enough for a carrier or in case that your toddler sleeps in the stroller, you could actually spend a whole day and evening outside your accommodation. But even the most active child cannot walk all day long. Here is a route that I have often followed myself with my young children. It is a realistic and real itinerary that is flexible and suitable for the whole family. It can start around 9am and end around 5pm. It includes some of the most important monument of the city. Syntagma Square is our starting point. 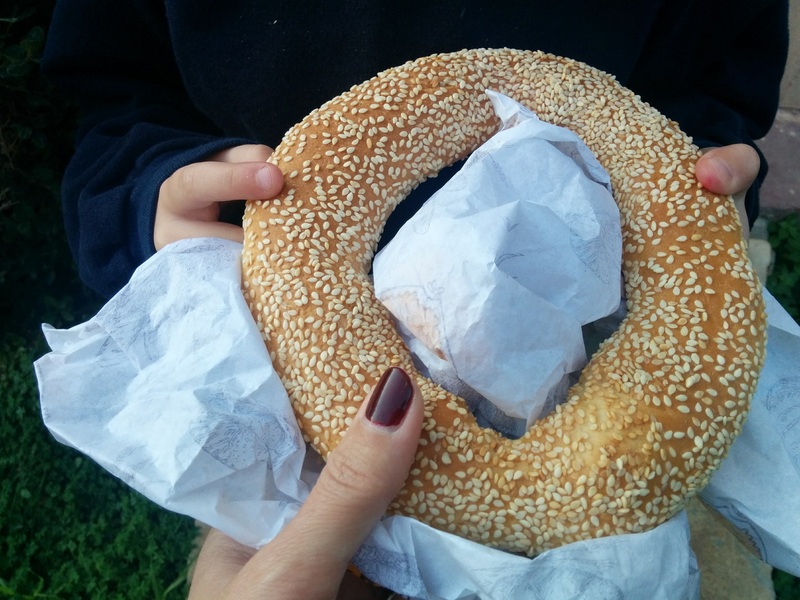 Here we can buy a real Greek morning snack: a fresh koulouri or sesame bread ring. They are sold by the street vendors on Syntagma Square. 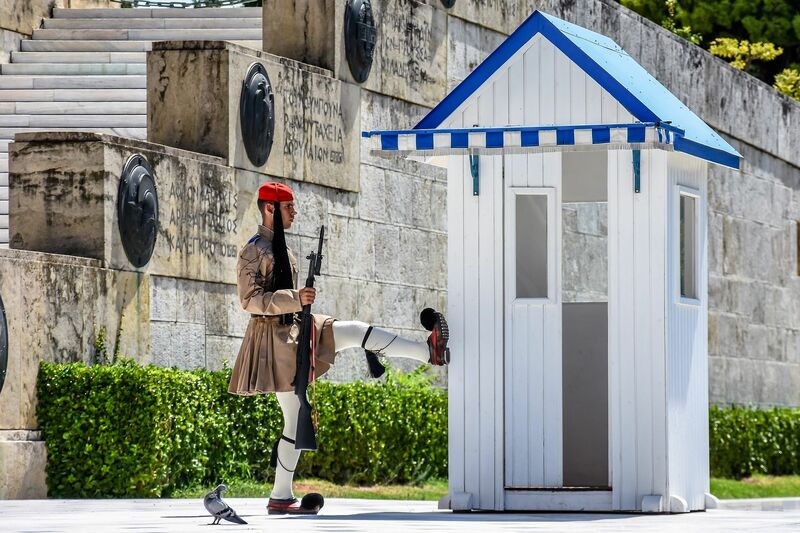 We can see the Greek Parliament Building here, Hermou shopping street and we can witness the changing of the ‘evzones’ or the Greek Presidential Guard at the Tomb of the Unknown Soldier. This takes place every hour, your kids will be fascinated! They will also enjoy feeding the pigeons here. Have a look at the metro station underneath the square, it is the largest in Athens and exhibits findings from the excavations when the metro line was constructed. From Syntagma Square you will walk for 10 minutes to enter the National Gardens at the entrance on Amalias Avenue. At the National Gardens, your kids can enjoy the little zoo, the turtle pond or have a play break at the playground. Older children will enjoy the children’s library or discover the amazing selection of trees and plants in the botanical gardens. There are public bathrooms and water fountains inside the playground. The park is stroller friendly. It is time for a break at Aegli Zappiou restaurant inside the National Gardens. It is a good chance to see another Athenian monument: the Zappeion Megaron. 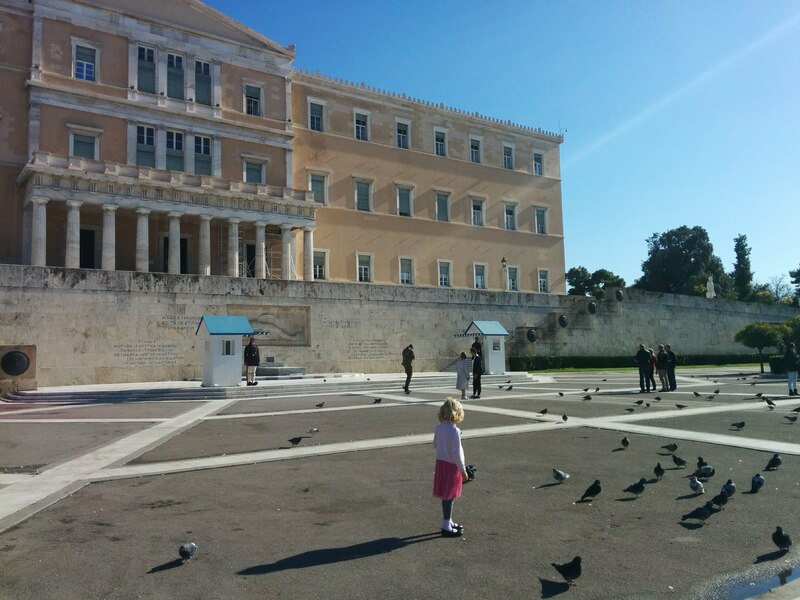 The square in front of the Zappeion (pictured below) is a great place to play! If it is warm enough to sit outside, you have a wonderful view over the Acropolis from these restaurants. And because there are no cars here, the kids can run around outside of the teras area and you will still be able to see them. Aegli has lots of healthy choices in both food and drinks and is family-friendly. Exit the National Gardens at Vasilissis Olgas Avenue and cross the tram rails. You have now arrived at the point of two very important archaeological monuments in Athens: The temple of the Olympian Zeus and Hadrian’s Arch. If your children are very young I would suggest to pass by and not enter the archaeological site of the temple, it is not stroller friendly. You can still see the temple and make photos for your photo album from outside of the site. 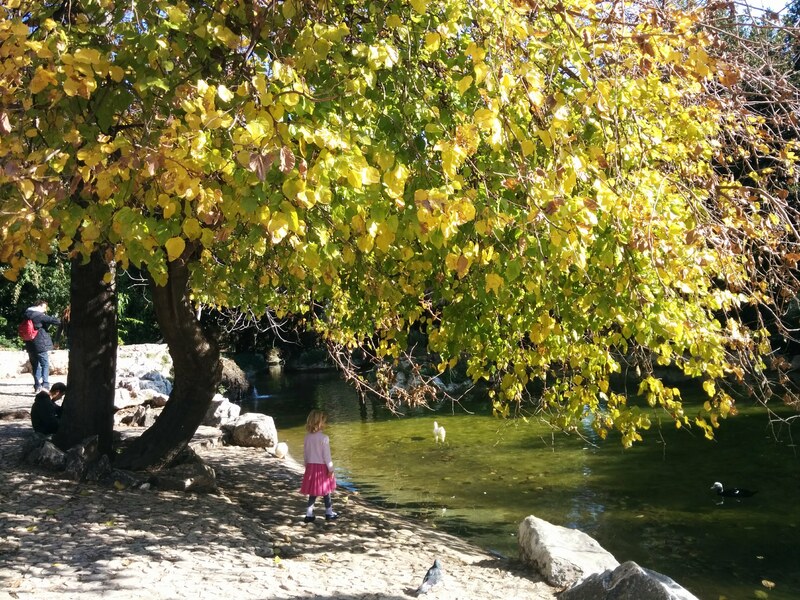 If your children are older, it is a wonderful place to explore. The site is small, suitable for an hour adventure. The Temple of the Olympian Zeus is a half-ruined temple dedicated to Zeus, the chief of the Olympian Gods, and that is how it took its name. 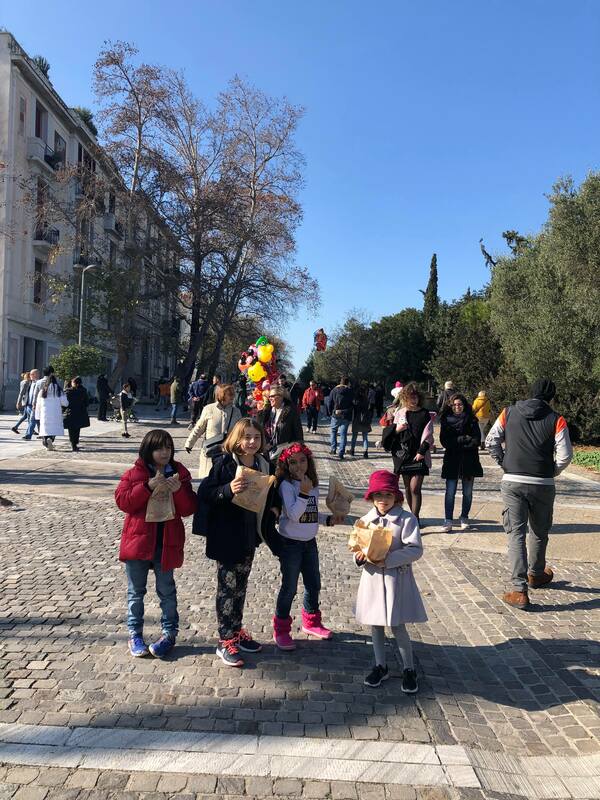 The temple of the Olympian Zeus is considered as one of the finest ancient monuments of the city and kids will find the columns very impressive! The photo below was taken during a Family Mythology Tour that my daughter and I recently joined. 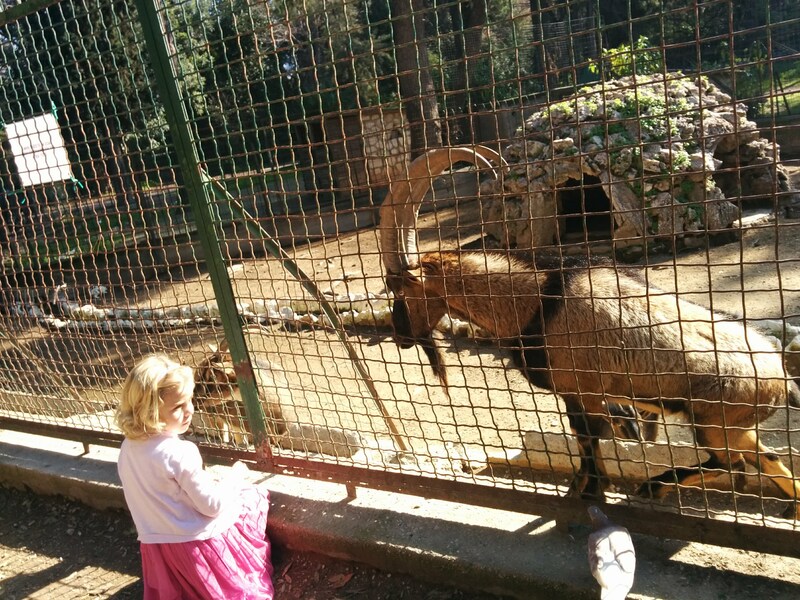 Our review and family experience can be found in my post Alternative Athens Tours for Kids. 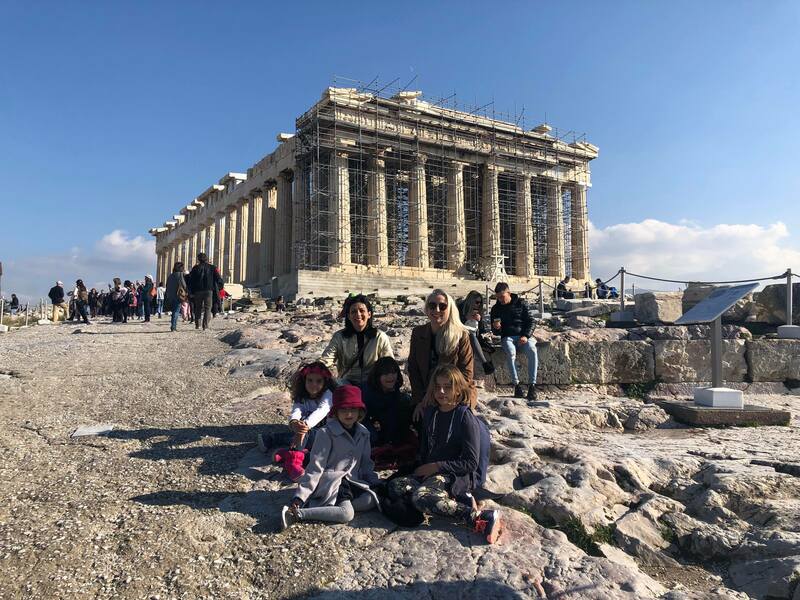 For information and prices on more organized Family Tours to the Temple of the Olympian Zeus, have a look at this list. Not in the mood to follow a tour? 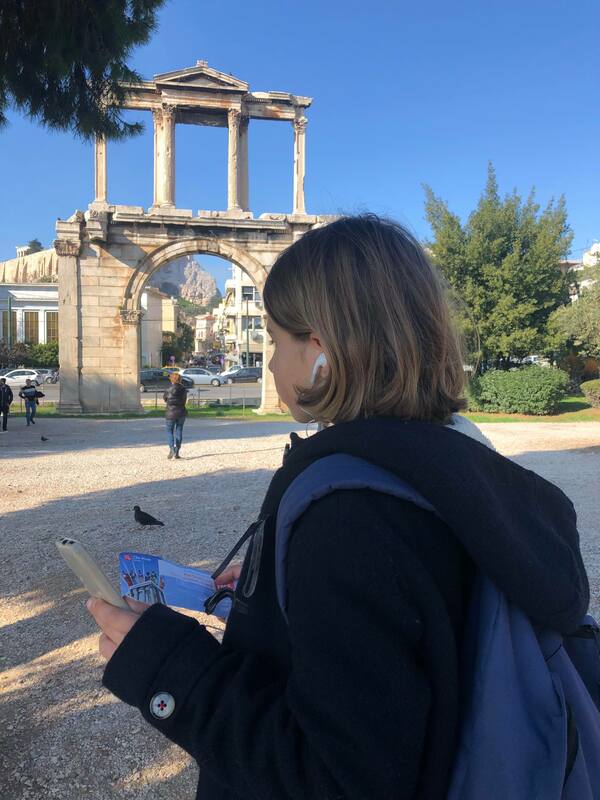 An inexpensive, flexible and fun way to visit the Temple of the Olympian Zeus or any of the other monuments in Athens with kids are the self-guided audio tours for families by Clio Muse. 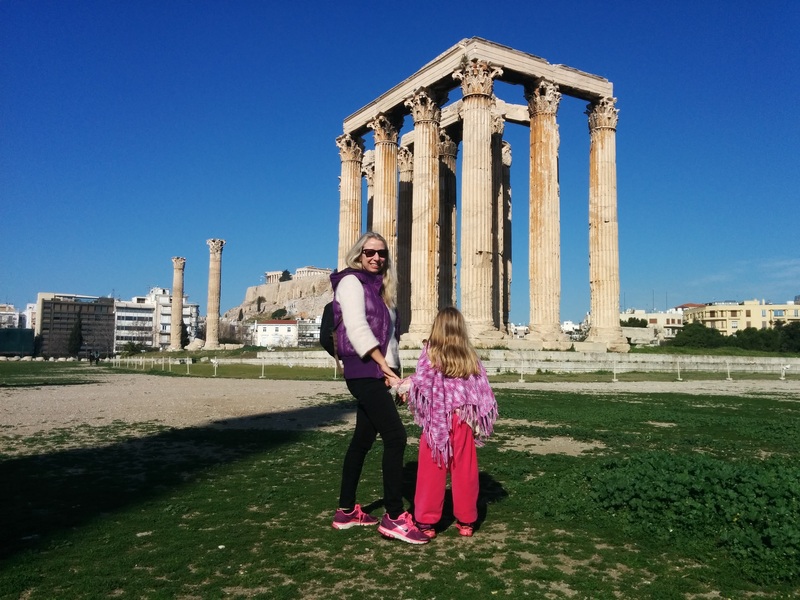 We tried an audio tour at the Temple of the Olympian Zeus, my daughter loved it! Clio Muse is a unique app offering affordable tours in Athens and Greece suitable for kids and teens. Several of them are free and great for discovering the city on foot. Have a look at the available family tours in Athens here. 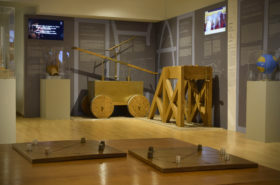 Are you excited to try a self-guided audio tour? Clio Muse offers a 15% discount on any Clio Muse tour to the readers of this blog. To receive your discount you need to use the code celeste2019. You can also combine your audio tour with a skip the line ticket and make your expedition even easier! Here you will find more information about a self-guided audio tour in combination with a skip- the-queue ticket for the Temple of the Olympian Zeus. One of my favourite landmarks in Athens. Have a look through the Arch and see the Acropolis and the southeast corner of the Parthenon. Tell your children that this Arch was built by Roman emperor Hadrian and divided Ancient Athens in the old and new part city. It is time for lunch. Cross Andrea Siggrou Avenue at the traffic lights behind the Hadrian Arch. You are now entering Plaka, the historic district in Athens. There are many lunch options in Plaka and many roads are carfree. My favourite places are around Lisikrati Square named after the Lysicrates monument. The children love playing there and we sit and have lunch in one of the restaurants around this little square having full vision on the children. 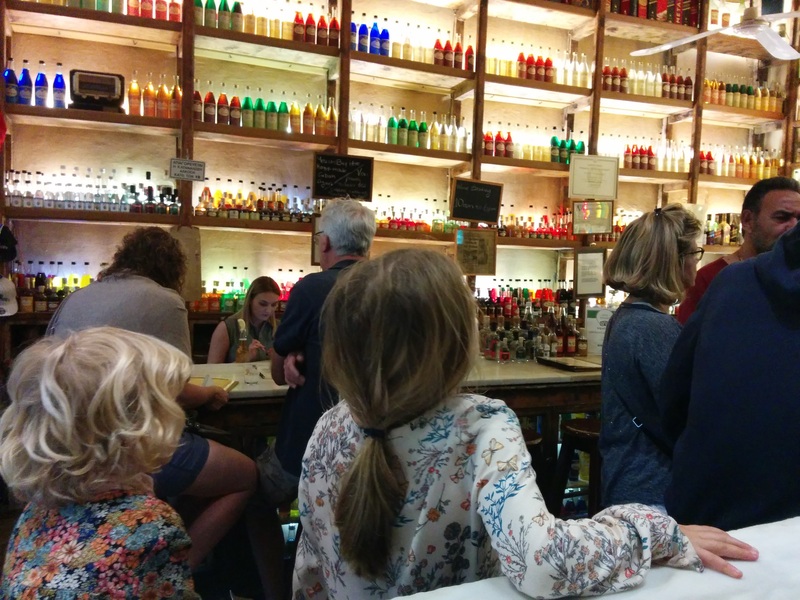 After lunch, walk over to Brettos Bar and show your children the many colours and shapes of Athens oldest distillery. After lunch, my walking route takes us towards the car-free Dionysiou Areopagitou road that leads up to the Areopagus Hill. The entrances to the New Acropolis Museum and Acropolis are located on this wide street. My kids always love running around here and listen to the street musicians and artists. There is always something to see and do and street vendors sell candy and nuts. 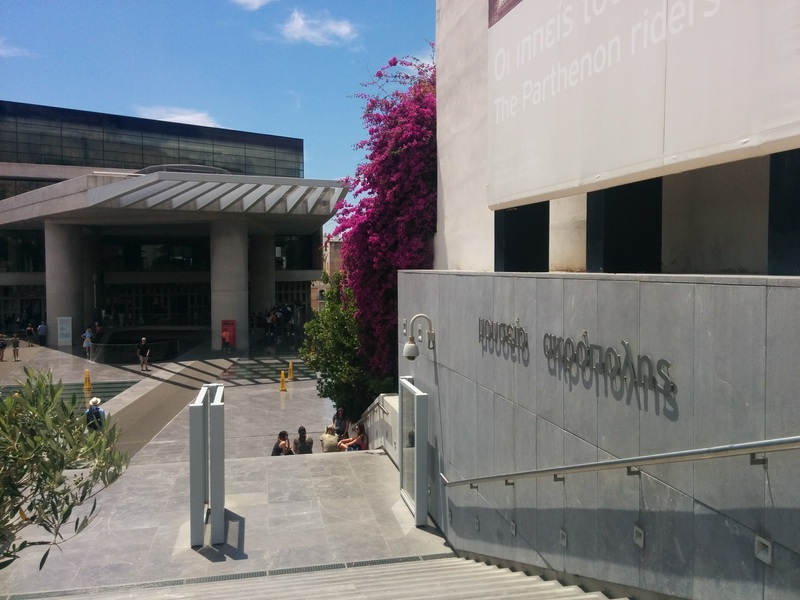 It depends on your children’s age if you want to visit the New Acropolis Museum, the Acropolis or both. My experience is that it is possible to visit them both in one day but you will need to start your day early at the Acropolis. For guided tours to the New Acropolis Museum, the Acropolis and skip-the-line tickets, or a combination of these, have a look here. If you decide to skip the museum, you may want to just go to the museum shop and find a beautiful souvenir for home. Lots of value for money children’s history and mythology books and games here. It is also worth visiting the museum garden. 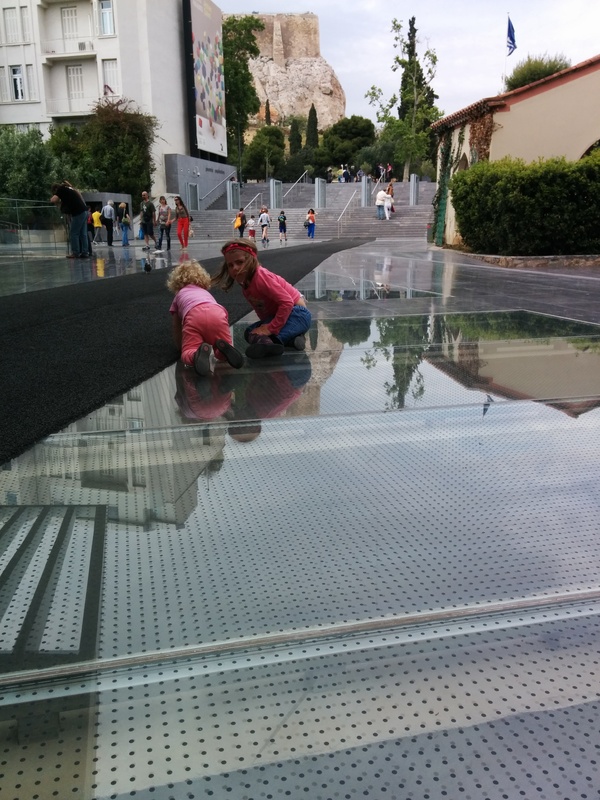 Parts of the excavations outside of the museum are covered with a glass floor and your kids will enjoy discovering what is under their feet. Finally, don’t miss the Athenian owl watching over you at the main entrance! If you decide to walk up Dionysiou Areopagitou you will pass the impressive Odeion of Herodes Atticus. My children always enjoy walking up this area, it is safe, there is lots of space to run around and the surroundings are beautiful. The walk up to the entrance of the Acropolis is steady but steep. 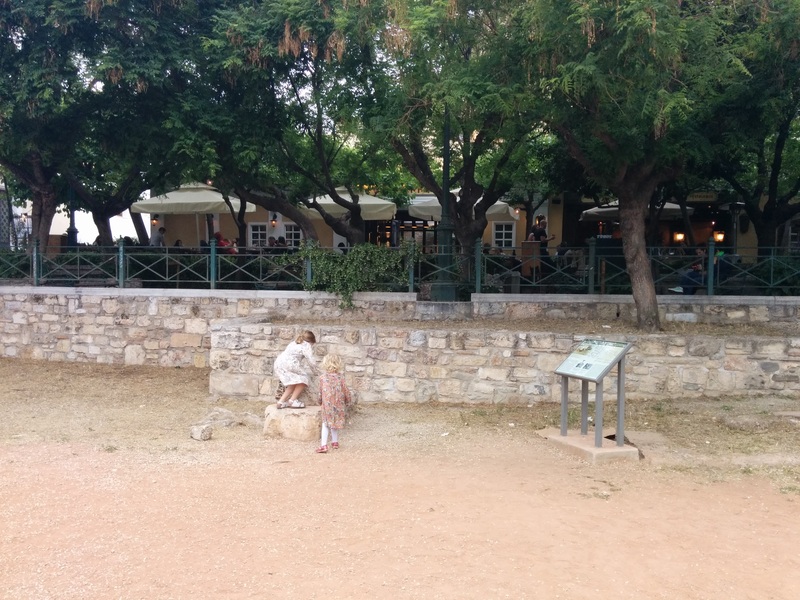 Older children can also climb up the Areopagus Hill. The grounds and the monuments inside the Acropolis archaeological site such as the Parthenon are not stroller-friendly. Strollers are not allowed inside the Acropolis. I have not included a visit to the Acropolis inside this walking tour. If you decide to visit the Acropolis with your children, I would recommend avoiding the queues with kids, especially in the summer season. If you want to skip-the-queue at the Acropolis, have a look here. Continue towards Plaka again via Theorias road (map) Walk around the tourist shops and let sounds, colours and smell of herbs, flowers and food inspire you. Your one day in Athens with kids has been successful. Have you got energy left for afternoon drinks or dinner? Stay in Plaka for a traditional Greek meal or continue to Agia Irini Square right of Aeolou Street. On this renovated hipster square are several options for drinks, souvlaki or Greek food. 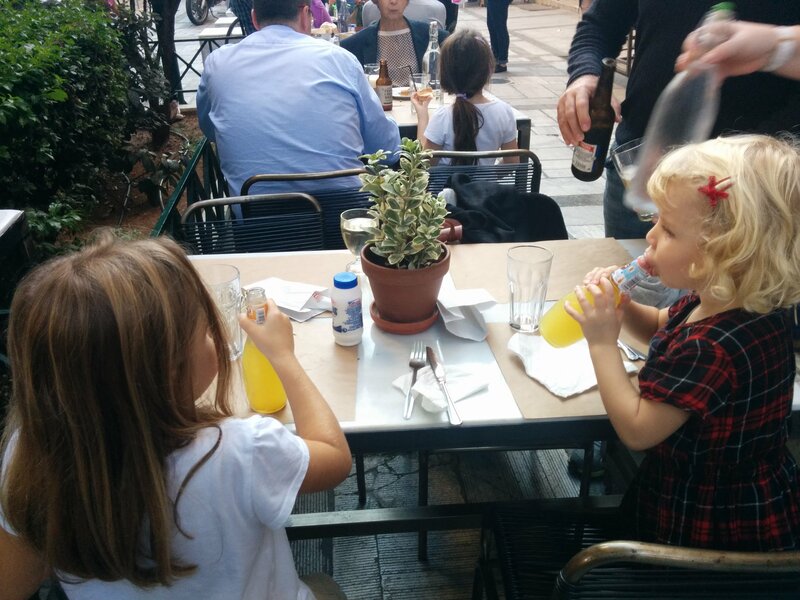 End your one day in Athens with kids drinking a cocktail or ice-cream whilst your kids play safely on this friendly car-free square. There are several organized walking tours in Athens specially designed for families with (young) children. I tried and tested four of such tours with different tour companies. In the following blog posts, you can find my family experiences. 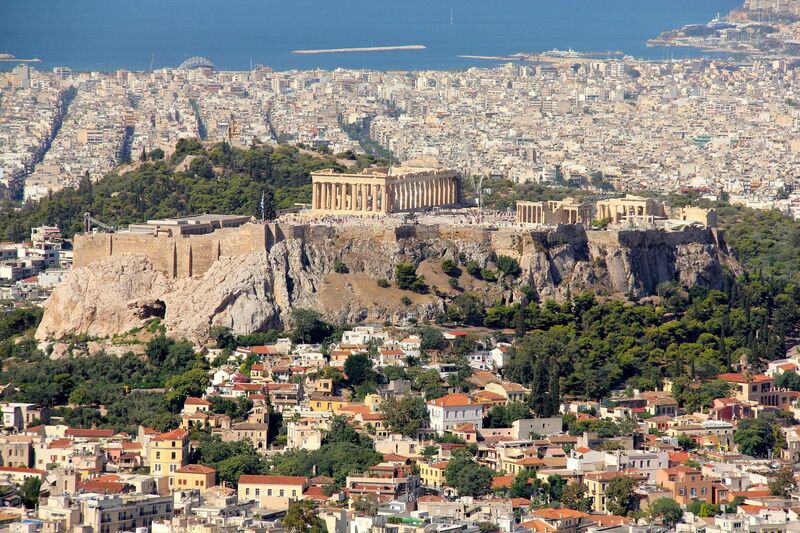 Tours in Athens for Kids is about an interactive family tour to the Acropolis. 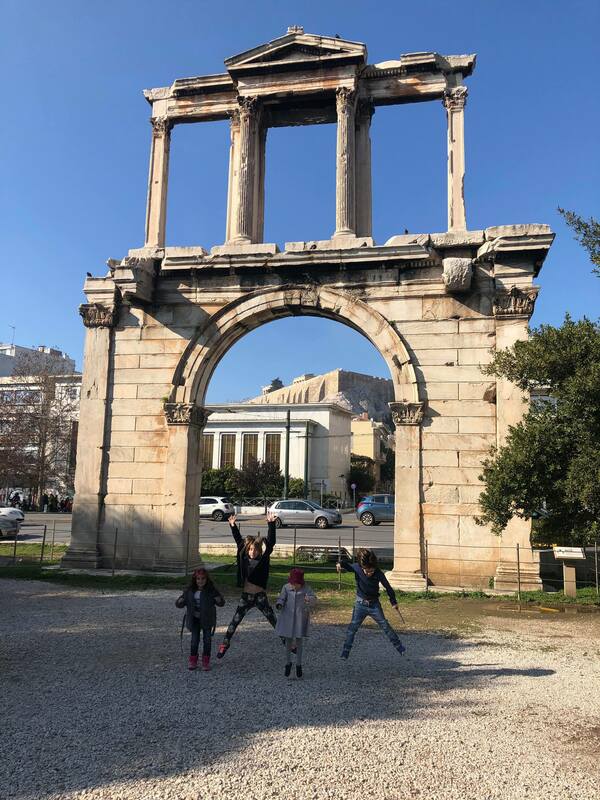 In Alternative Athens Tours for kids, I describe my experience with tour company Alternative Athens and a tour of Greek Mythology. Food Around Athens is the name of the company who took us around Athens tasting Greek food. In Things to see and do kids teenagers in Athens Greece, I describe my experience of a Street Art Tour. Our Family Food Tour in Athens is about a Family Food Tour through the picturesque neighbourhoods of Plaka, Anafiotika, Monastiraki and Psirri. For a list of organized family tours in Athens including price and reviews, have a look at GetYourGuide. Another alternative for a walking tour with children is to book a tour on the Athens Hop on Hop off Bus. Kids will love it! For information and prices, check here. 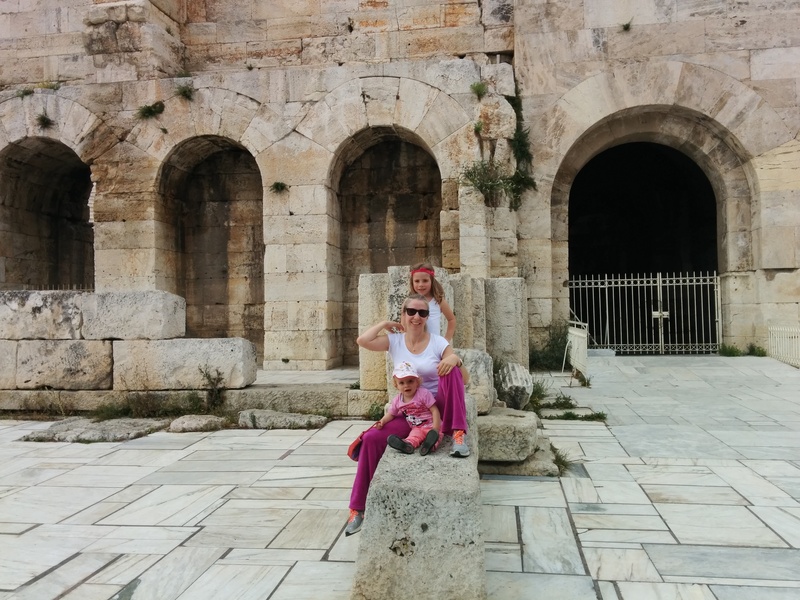 I hope you will love Athens and this walking tour with your kids as much as I did!